Dealing with stress is something we all deal with at some point in our lives. And the more we think about it, the worse it seems to get. You begin to feel like you’re at the end of your rope in complete desperation. You feel like it’s hopeless and there’s nothing you can do except cry out: Lord have mercy! You wonder if God has seen how faithful you’ve been and you feel underappreciated. In Sunday’s Gospel reading, which is about the healing of 10 lepers, we see that Christ can transform our stress into hope. Ultimately, it’s our faith in God that heals our hopeless and desperate situations. Leprosy in the first century was a very serious thing. The disease itself wasn’t pleasant. “Scales” appeared on the nerves, respiratory tract, skin, and eyes. As it progressed, the inflicted person lost the ability to feel pain, which often resulted in injuries, unnoticed wounds, or, in very serious cases, the falling off of extremities. In Israel, “leprosy” was considered to be a state of uncleanness, and the priest who diagnosed it ordered the isolation of the sick person. A ritual resembling a funeral service marked the departure of the person suffering from “leprosy” from the community of those who were well. In short, the leper’s situation was so hopeless that society declared the person dead! If that’s not a desperate situation, anxiety inducing, and stressful, than I don’t know what is! Yet, something remarkable happens when 10 lepers encounter Christ. As the story goes, Jesus was walking in region between Samaria and Galilee when 10 lepers called out to him from a distance. They hoped that Jesus would have mercy on them. In what may seem to be a surprising response, Jesus tells them to go and see the priests, the very priests who had condemned them to the edge of society. I can’t imagine they wanted to hear this. After all, no one wants to confront the person who had cast them out of the city and banned them from community, family, and friends. Nonetheless, they obeyed and something surprising happens–they were healed before encountering the priests. 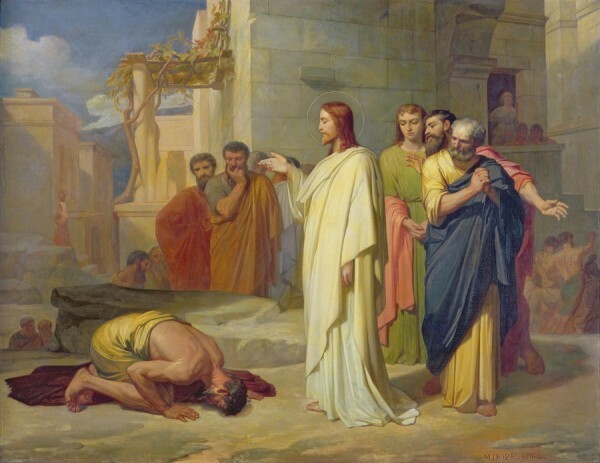 In the end, one of the lepers returns to thank Christ for this act of mercy. And, to everyone’s surprise, it was the foreigner who did this. Foreigners themselves, at this time, where seen as outsiders and on the edge of Jewish society. Yet, the model of faithfulness that Scripture gives us is a marginal person who was both a leper and a foreigner. According to the law, one wasn’t healed until the priest had examined him, a proper sacrifice was made, his clothes were washed, his hair shaved, and a bath taken (see Leviticus 14:3-9). Only then were you properly healed. Yet, Jesus shows that the gospel’s healing power is effectual without the law! Furthermore, this formerly leprous foreigner didn’t need the law to teach him how to glorify and thank God. If anything, he shames the others who knew the law, yet did not return to say “thank you” to Jesus. By trusting Jesus, this leper went from being “dead” to being made anew. A stressful and desperate situation was completely and utterly transformed. In many ways, we may feel like the leper. Our desperate situations may leave us wishing we were dead. We may feel like we’ve been cast out of society and nothing we do can ever make things right again. But, like the leper, we cry out to Jesus: Have mercy on us! Through our faithfulness, Christ will make us whole. Have you ever felt like a leper in a hopeless, left-for-dead sort of situation? Have you ever taken a leap of faith and trusted fully in Jesus? Are you thankful for a brokenness that Jesus has healed in your life? Come and See What, Exactly?